Jennifer Lee, a senior English lecturer at Pitt for the last two decades, said it was luck and allies in the tenure faculty that got her the job she currently holds — and she remembers realizing how privileged she was compared to faculty who don’t have those benefits. “My very good friend and colleague — who I worked with almost that whole 20 years, who did the same work that I did — had trouble getting promoted, had trouble rising to the same rank that I am even though we had done exactly the same work,” Lee said. Lee spoke about her experiences at the faculty union’s Card Campaign Kickoff Monday, which took place from noon to 1 p.m. in the William Pitt Union Ballroom. Assistant professor Paul Johnson of the communication department said the union initiative was born in August 2015, a few months after the grad students had started organizing, and has since advanced. Card signing was important to get a sense of how much support the group has. If the faculty union gets 30 percent of the approximately 4,000 full- and part-time faculty across all five of Pitt’s campuses’ support, it can hold an election to vote on the union. If it gets 50 percent, then Pitt has the chance to voluntarily recognize them as a union. The union has one year to get enough votes. As part of the effort to gain more support, doctoral candidate Beth Shaaban of Pitt’s epidemiology department, adjunct lecturer Carl Redwood in the School of Social Work and Pitt Progressives co-chair Sean Bailey, a sophomore computer science and philosophy major, all joined Lee in speaking at the event. 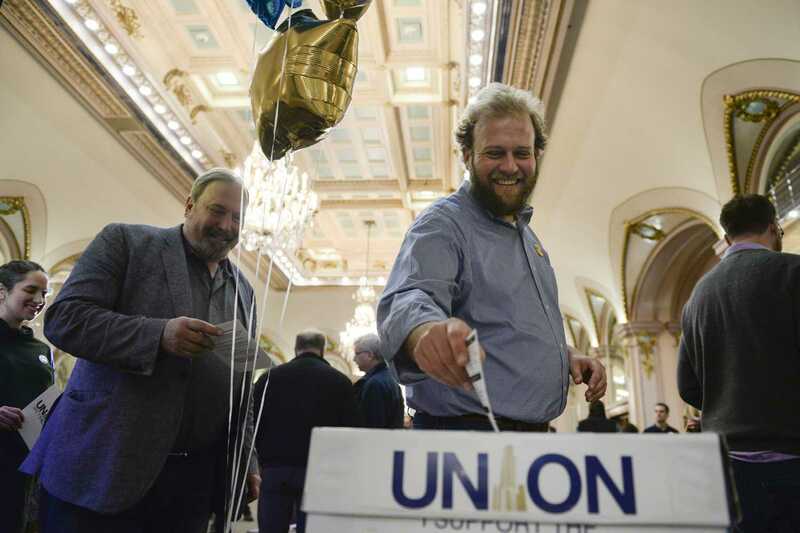 The event was intended to rally faculty support and resulted in approximately 65 signed union authorization cards, according to the Academic Workers Association of the United Steelworkers. “I also have lots of friends and colleagues — who have doctoral degrees, who are extremely talented teachers and are wonderful people — and they struggle to make ends meet in the economy of higher education,” Johnson said. If the union gets enough votes in the year-long time frame, then faculty can send letters of support for the union to Harrisburg. The event also gave attendees — approximately 80 total — the chance to text “PITTFAC” to 47486. After sending in a name and email, the texter could then suggest improvements based on their experiences at Pitt about current faculty pay and working conditions. Organizers were already in agreement with some suggestions and complaints, such as job security, transparency and better pay, which were common themes among the speeches. Assistant English professor Elizabeth Rodriguez Fielder said unionizing can help promote better planning in the classroom and in personal life. “Job security is important, because if you can imagine getting a call in August and knowing that you have classes or that the classes you thought you had you don’t have anymore, how are you supposed to plan for your family, your future?” Rodriguez Fielder said. The University did not comment regarding whether or not it will voluntarily recognize the union if the vote gets to 50 percent. In a similar situation, the University spoke out against the unionization efforts of Pitt graduate students, saying they would negatively affect relationships between the University and graduate students. Shaaban, who is a part of the Graduate Student Organizing Committee, spoke in support of a faculty union, drawing from her work with the upcoming grad union. “Today, Pitt faculty, those of us on the Graduate Student Organizing Committee affirm your inherent value and worth as human beings — not just as surplus value generators for your administration,” Shaaban said. Along with student support, Pitt Progressives also helped organize the event. Bailey said they got involved when USW Tamara Lefcowitz spoke with them about collaborating with the union, and Pitt Progressives fully supports the unionization efforts. While the event focused on faculty, Bailey said it is important for faculty and students to show support for each other to achieve similar goals.